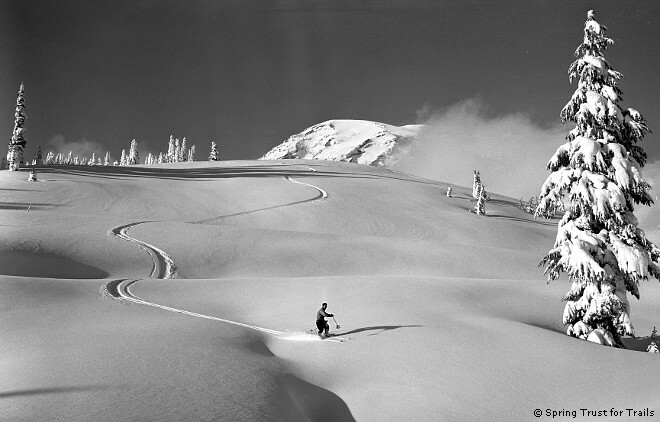 Skiing above Paradise, Mount Rainier in 1948. Photo by Bob and Ira Spring (negative #927). The best things in a man’s life are often his hobbies, and if he will not take his hobbies seriously, life will lose half its charm. And mountaineering is something more than a hobby... And so I make no apology for this attempt to trace the history of our noble sport. Lowell Skoog is a thorough and meticulous guy. It’s what you need in a preservationist. Getting the details right is a required historical imperative. But he is also a passionate and poetic guy when he writes about his love of ski mountaineering in the Cascade Mountains. As he says, “Skiing isn’t just about the turns, but about the people who make them.” At this time in his life, Lowell is attempting to meld his two sides. 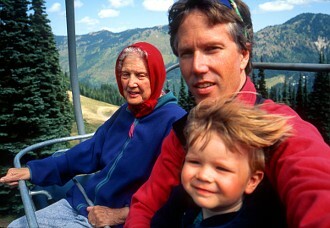 Self-portrait with mother Ingrid and son Tom in 1998. Photo by Lowell Skoog. Born in Seattle to skiing, Swedish parents, Lowell and his brothers, Gordy and Carl, grew up hot-dogging at Ski Acres and Crystal Mountain, learned to mountain climb in college and began venturing into the “American Alps” of the North Cascades. A degree in electrical engineering at the University of Washington landed Lowell a job designing computer software, but he used his free time and new climbing skills to explore ever deeper into the Cascade range. Around 2001, he was laid-off from his job during the dot-com bust, and he and his wife, Stephanie, decided he should take six to 10 months to work on the history project. Later, working as an engineering consultant, Lowell was able to devote time to his ski research, a growing number of related projects, and additionally raise a son. His historical enthusiasm is also a way for him to connect to his father, who passed away when Lowell was 20 years old, and the old Scandinavian ski jumpers from his past. On his vast Web site, Alpenglow.org, you can see that Lowell has been busy over the years, not only compiling his historical database, but also ticking off Cascade ski tours with his brothers and other ski partners. Many of the tours would, 25 years later, become the chain links for a ski route stretching 362 miles from Mt. Baker to Mt. Rainier, called “Skiing the Cascade Crest.” The route is dedicated to his late brother, Carl, who died in a steep skiing fall in Argentina in 2005. The Cascade Crest route is a poignant memorial to Carl Skoog, who was an accomplished skier and photographer and Lowell’s most consistent partner on countless trips. Carl’s beautiful imagery can be viewed on Alpenglow.org and the Mountaineers Foundation manages a memorial fund in Carl’s name. Traversing the Picket Range in 1985. Photo by Carl Skoog. The seed that launched Written in the Snows was Dwight Watson’s obituary published in the Seattle Times in 1996. Lowell recognized Watson’s name from brief passages in the books of Fred Beckey (the prodigious Northwest climber, original dirt bag and guidebook author). 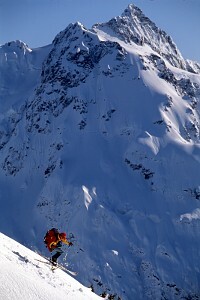 Watson, born in 1900, was the first to ski Eldorado Peak, North Star Mountain and Glacier Peak in the North Cascades. Lowell says, “I think his tour de force, in 1939, was the ski traverse of Mt. Baker from the Kulshan cabin to the Mt. Baker ski area, which I started calling Watson’s Traverse.” As Lowell began digging into Northwest skiing history, he contacted Fred Beckey directly. Beckey confirmed that Dwight Watson was the “key guy” in early Northwest ski mountaineering, and that his adventures dated back to the 1930’s. Based on a lead in Watson’s obituary, Lowell contacted the Seattle Mountaineers history committee seeking Watson’s old ski movies. The committee had the films and Lowell was allowed to view them. He was hooked. “So, Watson was the kernel that got me started on the whole project,” he recalls. Lowell eventually became a member of the Mountaineers history committee, allowing him access to more information and, more importantly, the film archives. He refers to these old ski movies as “historical ‘crack,’ because the more you see, the more you want.” He is now the chairman of the committee (like he needs one more thing to do) and is working with the Mountaineers to digitally transfer these “dusty old films dating back to 1928.” He has also gained access to private film sources, like the Bob and Ira Spring collection. The digital video copies are cataloged here. 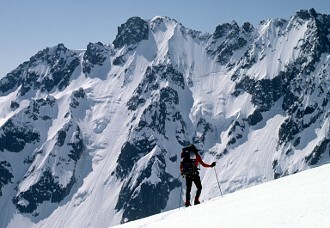 Skiing near Mount Shuksan in 1995. Photo by Carl Skoog. Last fall and winter, Lowell realized that he needed more photography for his book. He says, “I spent a lot of time chasing down pictures at the University of Washington, Museum of History and Industry, Mt. Rainier National Park, and several historical societies. “Lowell’s relationship with the Mountaineers has been especially valuable for obtaining access to photographs held at U.W. However, this endeavor also landed him another task and another distraction — archiving Bob and Ira Spring’s entire black and white photo collection. For those unfamiliar with the Spring twins, they started a photography partnership in 1946 and the two set to photograph Washington State as it had never been photographed before and will never be again. Lowell has another daunting task ahead of him. 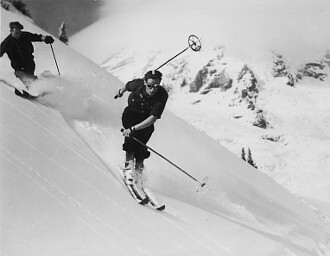 Don Amick and Bruce Kehr skiing on Mount Rainier in 1936. Photo by Dwight Watson, The Mountaineers Archives. With book queries getting a luke-warm reception from publishers like The Mountaineers Books and Sasquatch Books, the publishing process frustrated Lowell. “The book that I have in my brain, would anybody publish it?” He wonders. He says that most publishers responded that the market for his book is too small. Most likely, he will not be publishing Written in the Snows on paper, but instead as an on-line document. I objected that some of us would like his book on our shelves alongside the other beloved tomes of outdoor reference and that he should get paid for all his time and effort. Without hesitation, Lowell says he prefers a living, editable document, more like an on-line magazine than coffee table book. But he adds that he hasn’t given up the idea of publishing a version of the book on paper in the future. Otto Lang, founder of the Mt. Rainier and Mt. Hood Ski Schools, writer, filmmaker and all-around stylish Austrian, said before he died in 2006 that “It doesn’t matter how long it takes you to write a book, it only matters how good it is.” Like the Italian guy that took four years to paint a ceiling in the Sistine Chapel, Lowell Skoog has taken his time writing the definitive history of Northwest ski mountaineering, but when he is finished with his “painting,” I’m sure the details will be correct. This article was originally published in the October 2010 issue of Off-Piste Magazine. You can find it online here.